This is the sight that will greet a Gala Waterways Group work party on August 1. 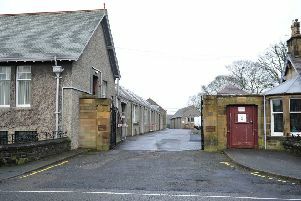 'The volunteers will embark on tree trimming and bank clearing session in the mill lade at Roxburgh Street, Galashiels. 'Anyone wishing to join them should be at the town's High Street car park at 10am. Bring wellies, but gloves and tools will be provided, although loppers, secateurs and saws will also be welcome. 'Alastair Lings (01896 757861/07763 850087) has more information. This is the sight that will greet a Gala Waterways Group work party on August 1. The volunteers will embark on tree trimming and bank clearing session in the mill lade at Roxburgh Street, Galashiels. Anyone wishing to join them should be at the town’s High Street car park at 10am. Gloves and tools will be provided, although extra loppers, secateurs and saws would be welcome. Bring wellies. Alastair Lings (01896 757861/07763 850087) has more information.